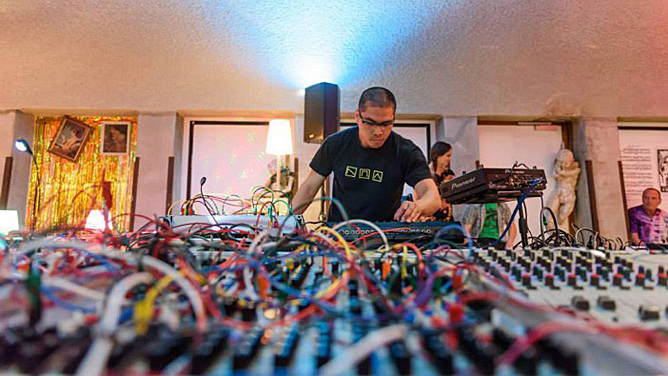 (h)ear and Cultura Nova present an evening with exciting modular synthesizer sounds. Expect a musical journey, in which cosmic atmospheres, hypnotic beats and a good dose of sound experiment will pass by. Bold, pioneering, but also swinging. The participating artists SONICrider, Mono-Poly, FRAKnoise, Jungle of Wires and OSC1899 represent the crème de la crème of the Dutch Modular Synth scene. Besides their live performances they will also introduce and explain their individual work process and creation of their sets. The modular synthesizer is an instrument which is made up of various components. The user of the modular connects these components to each other by means of patch cables in order to be able to produce sounds from them. Usually an arrangement of modular synths consists mainly of vintage collectibles. You don't wanna miss out this one! De deelnemende artiesten SONICrider, Mono-Poly, FRAKnoise, Jungle of Wires en OSC1899 vertegenwoordigen de crème de la crème van de Nederlandse Modular Synth scene. Zij laten hun producties horen, maar geven als extraatje ook uitleg over het werkproces en de totstandkoming van hun afzonderlijke sets. Jurgen Winkel aka SONICrider - 'Experimental - Danceable Music & Video Art'. Jurgen is a producer/musician/artist & performer. He started as musician as a member of the band Blind, an underground electro rock band during the late eighties and nineties. Blind toured several years in Europa and played on many festivals. The red line of the existence of Jurgen Winkel is sound in the broadest sense of the word; he works as a (studio) sound engineer (@ SONICriderSTUDIO), FOH engineer and monitor engineer, he also makes music/sound for film/dance & theater. By the name SONICrider, he started producing tracks. He currently combines electronic music and analogue sounds, producing experimental danceable music with all kinds of styles. During his performances the audience will be guided through a world of sound and vision. In addition, Jurgen is also initiator of Ableton User Group Eindhoven and initiator/organizer of Modulab Eindhoven. Jurgen is producer/muzikant/kunstenaar & performer. Hij speelde in de jaren tachtig en negentig bij de underground elektro-rockband Blind. Zij toerden een aantal jaren door Europa en speelden op vele festivals. De rode lijn door het bestaan van Jurgen is geluid in de breedste zin van het woord; zo werkt hij als (studio) geluidstechnicus (@ SONICriderSTUDIO), FOH engineer en monitor engineer, tevens maakt hij muziek/geluid voor film/dans & theater. Momenteel combineert Jurgen - onder de naam SONICrider - elektronische muziek met analoge geluiden en produceert hij experimentele dansbare muziek in allerlei stijlen. Tijdens zijn optredens wordt het publiek geleid door een wereld van beeld en geluid. Daarnaast is hij initiator van de Ableton User Group Eindhoven en initiator/organisator van Modulab Eindhoven. Mono-Poly aka Dennis Verschoor began exploring and buying synthesizers around 1994. It all kicked off with a Crumar Bit One synthesizer and later on he added a Korg Mono/Poly and Roland JX3P. After that things came and went, and the setup changed over and over. At some point he realized he loved moving knobs and programming more than playing with those white and black things on my synthesizers. Soon he bought my first modular synthesizer, an ARP 2600 and that started a never ending story. At some point in 2007 he went to an Electro-Music.com event in Belgium called 'Chateau Sonore' where he met a guy who programmed self playing patch noodles on the Clavia G2 modular. It fascinated him and Dennis became really passionate about self generating patches that play stuff without any human or computer manipulation at all. Nowadays he runs a modular event in the Netherlands called 'Noodlebar'. This is the spot to play modular synthesizers and they have artists from all over the world coming over. Mono-Poly played at festivals like Freerotation and did stuff for Intergalactic fm. He has releases on Doppelganger records, Strange Life Records and more... Dennis also played at various places like Amsterdam, Brussels, Berlin, Oxford, Manchester, Copenhagen, Estonia, Myanmar, and Chengdu. Mono-Poly aka Dennis Verschoor begon met het verkennen en kopen van synthesizers rond 1994. Het begon allemaal met een Crumar Bit One synthesizer en later voegde hij er een Korg Mono / Poly en Roland JX3P aan toe. Daarna kwamen en gingen dingen en veranderde de set-up steeds opnieuw. Op een gegeven moment besefte hij dat hij graag knoppen dirigeerde en programmeerde, meer dan spelen met die witte en zwarte dingen op mijn synthesizers. Al snel kocht hij mijn eerste modulaire synthesizer, een ARP 2600 en dat begon een verhaal zonder einde. Op een gegeven moment in 2007 ging hij naar een Electro-Music.com-evenement in België, genaamd 'Chateau Sonore', waar hij een man ontmoette die zelfspelende patch-noedels programmeerde op de Clavia G2-module. Het fascineerde hem en Dennis raakte echt gepassioneerd door zelfontwikkelende patches die dingen afspelen zonder enige menselijke of computermanipulatie. Tegenwoordig runt hij een modulair evenement in Nederland genaamd 'Noodlebar'. Dit is de plek om modulaire synthesizers te spelen en er komen artiesten van over de hele wereld langs. Mono-Poly speelde op festivals als Freerotation en deed dingen voor Intergalactic fm. Hij heeft releases op Doppelganger-platen, Strange Life Records en meer... Dennis speelde ook op verschillende plaatsen zoals Amsterdam, Brussel, Berlijn, Oxford, Manchester, Kopenhagen, Estland, Myanmar en Chengdu. FRAKnoise aka Allard Krijger is a multi instrumentalist and multi media artist from Eindhoven. Allard started out as a singer songwriter influenced by the music of Van Der Graaf, King Crimson and Gentle Giant. Yet his first album 'The Fables Of Allard Warrior' is rather electronic music than anything else. Interest in the phenomenon of 'ugly noises' has left a big mark on this early work. The second album 'InterBabylonianMusicals', published by Eevonext, is also a concept album. The subject is language, and in particular its rhythmic and melodic aspects, where each track is provided with a matching video intended to be viewed on a small (smartphone) screen. Besides music, there are other projects such as modernnymphs.com and Allard writes science fiction/fantasy stories (lulu.com/spotlight/allardkrijger). 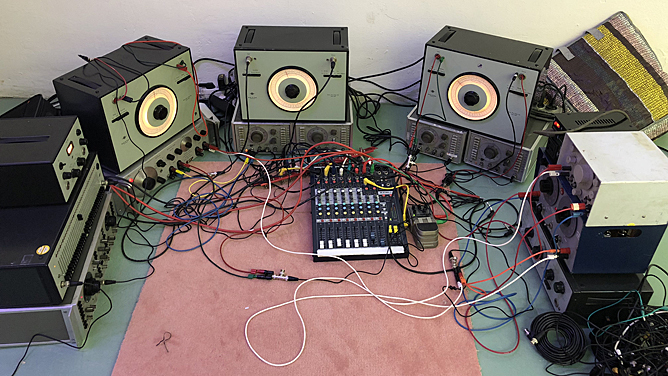 In 2017, Allard and Stefan Robbers started Modulab Eindhoven, an initiative intended to link modular synthesis with other art forms and to present it in Eindhoven and surroundings. Regularly modular music evenings are organized. 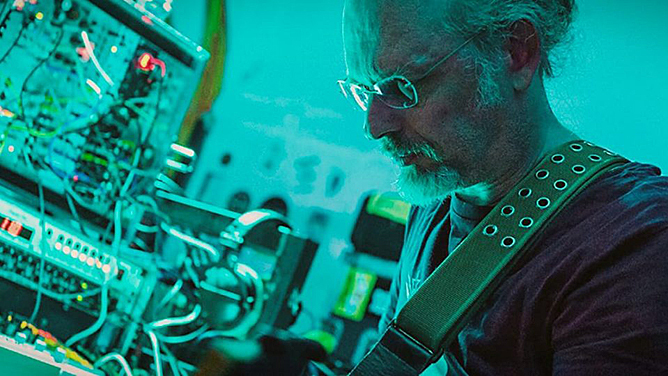 Nowadays Allard works with modular synths, casio keyboards, guitars and other string instruments and many effects. And the theremin of course. His music is narrative and can not be classified as a specific style. Sometimes it sounds like 80s music, sometimes as avant garde leftfield electronics with chiptune influences, often a modulated radio as the basis for the beat. During Cultura Nova FRAKnoise will play a set with modular synthesizers, radio, an electronic piano, theremin and lots of effects. FRAKnoise aka Allard Krijger is een multi-instrumentalist en multi-media kunstenaar uit Eindhoven. Allard is begonnen als singer songwriter beïnvloed door de muziek van Van Der Graaf, King Crimson en Gentle Giant. Toch is zijn eerste album 'The Fables Of Allard Krijger' eerder elektronische muziek dan iets anders. Interesse voor het fenomeen 'lelijke geluiden' heeft een grote stempel gedrukt op dit vroege werk. Het tweede album 'InterBabylonianMusicals', uitgegeven door Eevonext, is ook een concept album. Het onderwerp is taal, en dan met name de ritmische en melodische aspecten daarvan waarbij iedere track van een bijpassende video is voorzien bedoeld om op een klein (smartphone) scherm te bekijken. Naast muziek zijn er ook andere projecten zoals modernnymphs.com en schrijft Allard sciencefiction/fantasy verhalen (lulu.com/spotlight/allardkrijger). In 2017 richt Allard samen met Stefan Robbers Modulab Eindhoven op, een initiatief bedoeld om modulaire synthese te verbinden met andere kunstvormen en een plek te geven in Eindhoven en omstreken. Regelmatig worden er modulaire muziekavonden georganiseerd. Tegenwoordig werkt Allard met modulaire synths, casio keyboards, gitaren en andere snaarinstrumenten en veel effecten. En de theremin natuurlijk. Zijn muziek is verhalend en niet in een specifieke stijl te vatten. Soms klinkt het als jaren 80 muziek, soms als avant garde leftfield electronics met chiptune invloeden, vaak een gemoduleerde radio als basis voor de beat. Tijdens Cultura Nova zal FRAKnoise een set spelen met modulaire synthesizers, radio, een elektronische piano, theremin en heel veel effecten. Jungle of Wires is a project of Mandy Bakker. She is moving within the music scene for over 15 years now with drums, brass and electronics within all kinds of music genres. A year ago she discovered modular synths and got hooked. Coming from playing in bands there is always a story in every patch with lots of rhythmic exploration, improvisations and vocals. 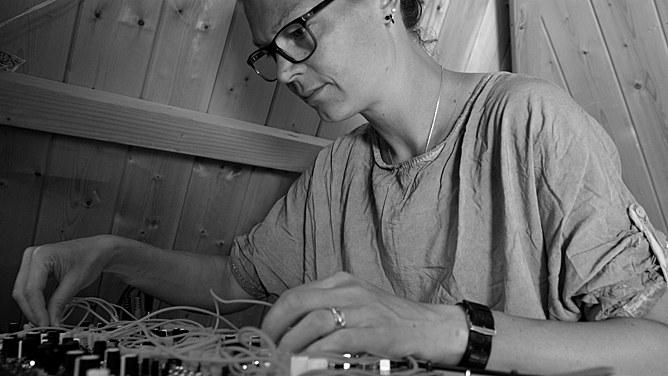 Jungle of Wires is een project van Mandy Bakker. Ze heeft al meer dan 15 jaar iets met muziek... Drums, saxofoon en de laatste jaren hardware synths en drummachines. Een jaar geleden ontdekte ze de modulaire synthesizer en was verkocht. Omdat ze veel in bandjes heeft gespeeld zit er in elke patch een verhaal. Het is een ritmische ontdekkingsreis met improvisatie en vocalen. Rotterdam based synthesist Chris David a.k.a. OSC1899 is collecting and playing synthesizers since 2007. 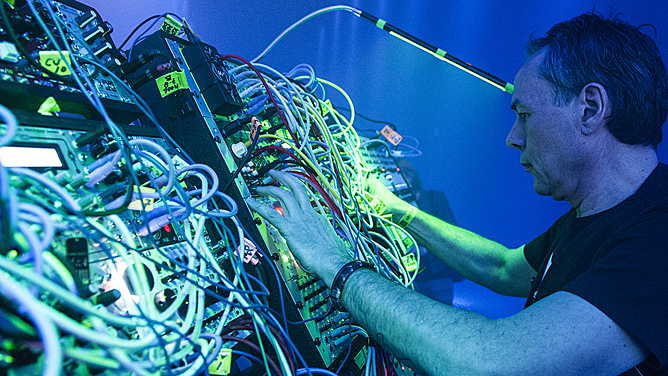 About 3 years ago he entered the modular synth scene and met Mono-Poly at one of his events. His first modular synth gig followed soon and he did a live performance for Noodlebar at BAR. Up until now OSC1899 has build up an interesting track record of live performances. To name a few: Freerotation, Electric Deluxe, Kuru Festival, LeGuessWho, Pitch Festival, Sines&Squares, STRP, Todaysart and Noodlefest. "A lot of live performances are held under the moniker of the Noodlebar Soundsystem. But I also performed live under my own signature." Since late 2016 OSC1899 consists of two members; Chris David and Willemijn Ketting. Willemijn has a musical degree on arrangement and composition. Also she is deeply interested in synthesis and sound scaping. The setup varies per event and depends on the location, timetable and vibe of the area where he is playing. "Mostly I use a Serge modular, TR808/909, EMS Synthi and some FX like the Roland Space/Chorus Echoes. Furthermore we are a great fan of the Rob Hordijk modular. Rob has done an excellent job building a modular synthesizer which is excellent designed, sounds very good and has a great understandable user interface." We must not forget to mention that all live performances are fully improvised. De in Rotterdam gevestigde synthesist Chris David aka OSC1899, verzamelt en speelt synthesizers sinds 2007. Ongeveer 3 jaar geleden trad hij toe tot de modulaire synth scène en ontmoette hij Mono-Poly op een van zijn evenementen. Zijn eerste modulaire synth optreden volgde snel en hij speelde een live set voor Noodlebar bij BAR. Tot nu toe heeft OSC1899 met zij optredens een interessante staat van dienst opgebouwd. Om er een paar te noemen: Freerotation, Electric Deluxe, Kuru Festival, LeGuessWho, Pitch Festival, Sines & Squares, STRP, Todaysart en Noodlefest. "Veel live optredens worden gehouden onder de naam van het Noodlebar Soundsystem, maar ik heb ook veel live gespeeld onder mijn eigen naam." Sinds eind 2016 bestaat OSC1899 uit twee leden; Chris David en Willemijn Ketting. Willemijn heeft een muzikaal opleiding in arrangement en compositie. Ook is ze erg geïnteresseerd in synthese en sound scaping. De opstelling varieert per event en is afhankelijk van de locatie, het tijdschema en de sfeer van de ruimte waar hij speelt. "Meestal gebruik ik een Serge-modular, TR808 / 909, EMS Synthi en wat FX zoals de Roland Space/Chorus Echoes. Bovendien zijn we een grote fan van het Rob Hordijk modulaire systeem. "Rob heeft uitstekend werk verricht door een modulaire synthesizer te bouwen die uitstekend is ontworpen, erg goed klinkt en heeft een gebruikersvriendelijke interface." We mogen niet vergeten te vermelden dat alle live uitvoeringen volledig geïmproviseerd zijn.